The FCDL Series of stiffened bins are a strong, cost effective solution for a wide variety of applications, including storage bins, drying bins, drying bins with stirring devices and drying bins with recirculating equipment. The FCDL bins are provided with 12” plenum punching (standard) to facilitate installation of a full floor. Depending on the size, most bins have a two ring door, which is installed in the upper half of the bottom ring and all of the second ring to facilitate floor installation. Consult with your GSI dealer for specifics on appropriate and permissible bin sizes for bin drying applications and stirring device installation. Grain Systems (GSI) has brought sound engineering principals used on large “commercial”/stiffened grain tanks to “on-farm”/stiffened grain bins. The same concepts of allowing vertical sidewall stiffeners to carry vertical grain loads improving the hoop load capacity of the sidewall panels, have been applied to this product line. 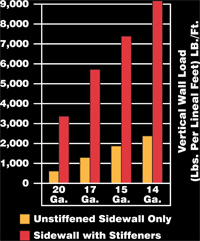 The graph (right) shows the tremendous increase in vertical load carrying ability that stiffeners bring to normally unstiffened sidewall panels. GSI stiffeners are manufactured from high strength 65,000 PSI (450 MPa) steel and feature strong splice joints and a large cross sectional area for maximum strength. 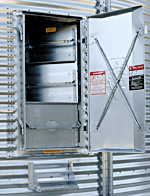 The 4” wide corrugated sidewall design is standard on the FCDL Series with each panel double row, hill and valley bolted for strong panel connections. GSI sidewall sheets are 44” tall and constructed from high tensile, galvanized steel for long tank life. In addition, GSI uses graded, zinc plated, dichromate coated bolts at all connections with sealing washers to keep out the elements. To securely anchor the bin, special stiffener anchor/base plates are used at each stiffener location. These stiffener anchors effectively hold the bin in position when the bin is full, being unloaded or standing empty. The anchors also provide a bearing plate for each base stiffener. Just as with the corrugated sidewall sheets, GSI fabricates all roofs out of prime, high tensile, G-90 galvanized steel. The higher tensile steel adds up to 20% more strength, with no extra weight, which is critical in clear span structural design. 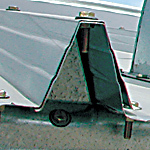 Roof eave clearance can be easily set at the time of installation with the use of GSI eave clips. The roof may be set to increase exhaust area for drying applications or positioned low to help prevent the elements or small pests from entering the bin during long term storage. Each roof rib is roll formed with three supportive bends in the vertical sides and roof ribs are taller, fully double lapped and have four reinforcing ledges for maximum moisture resistance. Roof vent panels feature a tall extruded lip which detours water and condensation around and down the roof panel. Bolt holes in the vent panels have been prepunched to reduce erection costs and insure proper vent placement for maximum airflow. Two types of vents are available to fit your particular setup. The hinged grill vent features a vertically mounted, wide spaced, wire grilled screen to keep out pests and swings freely out to allow easy release of trash buildup. The Auto-Vent utilizes a wing shaped damper which floats open when fans are in operation and drops down and closes when fans are off. Both vents are assembled with a heavy duty lock seam and for additional protection, a special die-cut gasket is placed between the vent and the roof panel to further decrease water penetration. GSI also manufactures a power roof exhauster for situations requiring greater airflow. These are available in a 24” diameter, two HP model and an 18” diameter, 1/2 HP model. A large 30 inch diameter peak opening allows for fast filling, easy access to overhead equipment and greater air flow during drying. 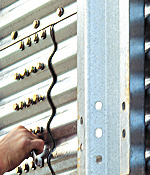 GSI’s hingeless, galvanized cap slides on rods to open and close, an easy and safer method, especially on windy days. When closed, the peak cap seals tightly and is held securely closed with a spring loaded latch. All inner door panels on GSI’s walk through door open completely with no horizontal bars or braces to unbolt or remove. Specially designed lever latches multiply the inner door opening force by 20 times to counteract friction set from grain loads, requiring no use of wrenches or tools. Other features include a probe opening for easy grain inspection and factory caulked door frames reducing installation time. 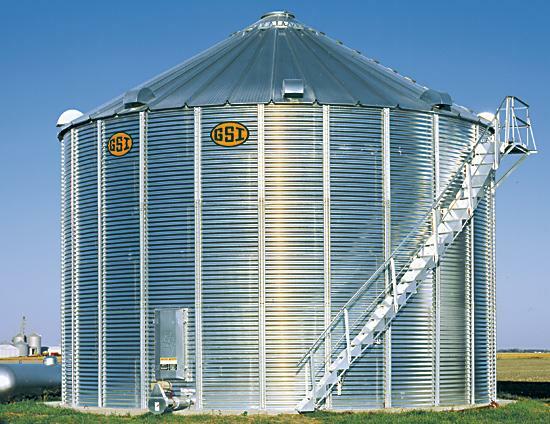 A heavy-duty 24” diameter access door is also available and standard on some taller 4” Stiffened bins. And, as an option, a heavy gauge, galvanized step can be ordered providing a step-up to doors or other hard to reach areas. Sturdy sidewall ladders, ladder cages and stairways provide easy access to and from the bin roof. Ladder sections are die formed from galvanized steel, come in 22” or 44” lengths and incorporate dimpled rungs for a better grip. All ladder cages are completely galvanized, bolt directly to the prepunched sidewall ladders and feature a bell opening at the bottom of the cage allowing ample space when entering and exiting the ladder. Optional stairways, featuring handrails and perforated steps, are available providing a more convenient alternative to ascending and descending the bin. In addition, GSI manufactures optional, full-circle roof rings and eave platforms providing additional convenience for roof work or inspection.